You will receive 52 vector graphic files in SVG and EPS (encapsulated post script) format. Each file holds the design of a face of a card from a standard deck of cards. These faces are for example used in Bicycle cards from USPCC, but can be found in many other brands and non-brand decks. 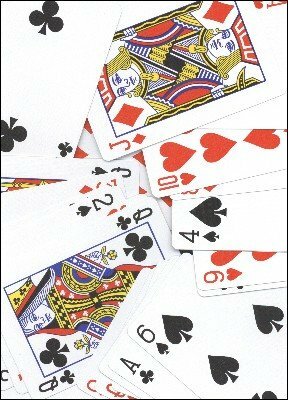 All cards from Ace to King in all four colors, Hearts, Diamonds, Clubs, Spades are represented. There are no jokers and no backs included. Each card is a vector graphic and can therefore be altered and modified in any way you like without loss of quality. You will need a vector graphic tool like the free Inkscape or quite expensive Adobe Illustrator to modify these files, combine them, export to other formats and print them out. Each file has the card itself plus cut marks and boundary, which can easily be deleted should you not need them. Starting from these designs it is very easy to prepare split face gaff cards, or exchange an index of a card with an index of another card. And that is merely the very beginning of what you can do with these designs.